Every now and again something will come in to my wardrobe and I'll wonder how i ever lived a day without it, that would be the rainbow knit which i featured in last weeks wishlist post. I just love everything about it, the colour, the shape, the material... it's just perfect! I should also point out that even though i did get the bag on eBay it was MONTHS ago and it was the ONLY time i've ever come across a LV. So please don't ask me to find you one as i really won't be able to help, even though I'd like nothing more! So i've got an exciting event coming up on Saturday (25th) which involves you lovely ladies! I'm going to be at the Selfridges Trafford Centre (Manchester) with Karen Millen for their Destination Denim Event (all info here) and you're more than welcome to come with me! From what i've heard so far it's going to be really exciting and it'll be a nice way to meet some of you. So if you want to come just email Dil Uppal at dil@handpickedmedia.co.uk and he'll get you an invite! Let me know if you're planning on coming too! Last week was so busy at work i didn't know if i was coming or going! I didn't manage to keep on top with blog stuff either, especially with the the giveaways. So i've still got 3 pairs to giveaway and a winner to pick which i will sort out asap! For everyone else i will get your sunglasses posted this weekend whilst I'm at home. I can't wait to go home for the bank holiday and catch up with everyone. Fingers crossed we'll have some of the blazing sunshine everyone in the south seemed to have! 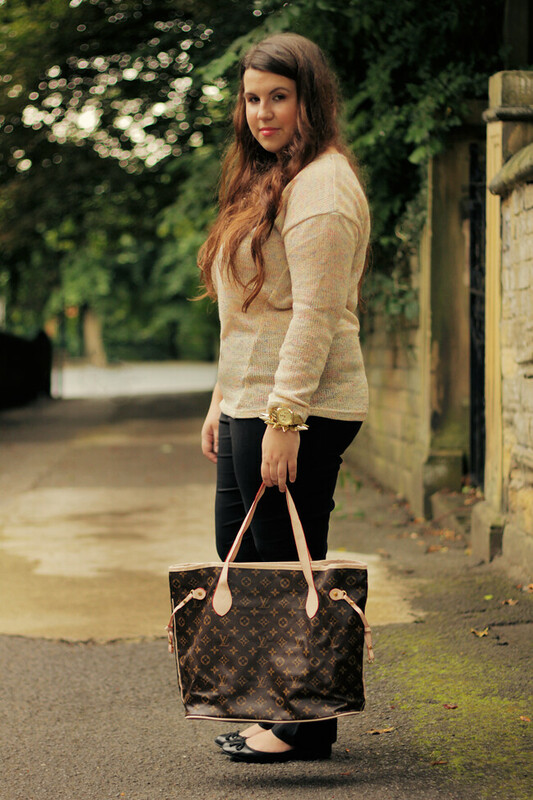 P.S This is my 140th outfit post! I love that bag! Great outfit, girl! you look amazing! and that jumper looks so comfortable! Lovely outfit! Love your top and bag! That jumper is beautiful, the colours are perfectly subtle! What a gorgeous outfit, that's right up my street! Love the colours! Effortlessly classy as always! 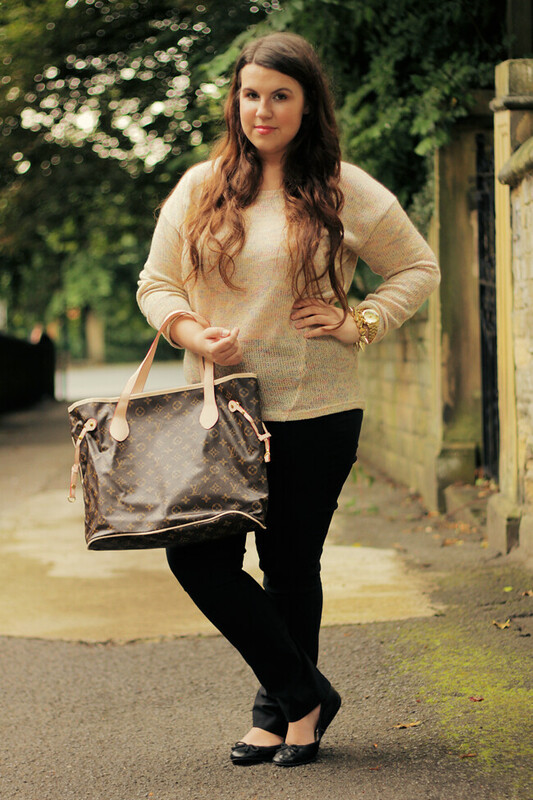 Love the outfit, I have that jumper in grey and it's such a lovely piece to have.. goes with so much! Ah love this outfit! classy and comfy! Especially your jumper, pretty! LOVE the bracelet! Can't envisage a day where I don't like spikes anymore! I really like your outfit and your hairs are so beautiful!! 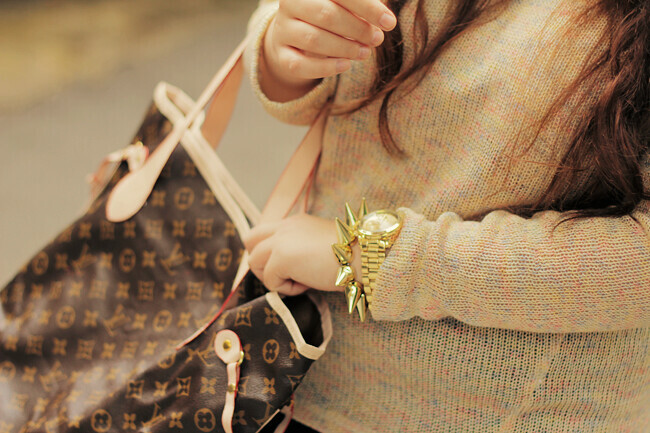 My favourits are the sweater and your jewellry! Everything match perfectly! Wow! You look so lovely !! this might be a way for me to finally wear neutrals without looking washed out as it has those little hints of brighter pastel - does the sweater have the colours knitted in or are they stuck on?